Definition: pH is the negative logarithm of hydrogen ion activity in a solution. The Concentration ratio of hydrogen ions (H+) and hydroxyl ions (OH-) determine the pH value of a solution. Any hydrogen activity will produce a 59.16 mV/ pH unit across the glass membrane. The measurement is expressed on a scale of 0.0 to 14.0. Water with a pH of 7 is considered neutral (H+ ions = 10-7 and OH- ions =10-7). A solution is considered acidic when the hydrogen ions (H+) exceed the hydroxyl ions (OH-), and a solution is considered an alkaline (base) when the hydroxyl ions (OH-) exceed Hydrogen ions (H+). A pH instrument consists of three main components, refer to Figure 1. The pH measuring cell: Hydrogen sensitive glass is blown onto the end of an inert glass stem. A silver wire, treated with silver chloride (Ag/AgCl) is sealed inside the glass (cell) with a solution of potassium chloride saturated with Silver chloride. The measuring solution has a neutral pH level of 7 or 0 mV. A properly hydrated glass sensor will produce a "Gel Layer" on the inside and outside of the glass membrane. 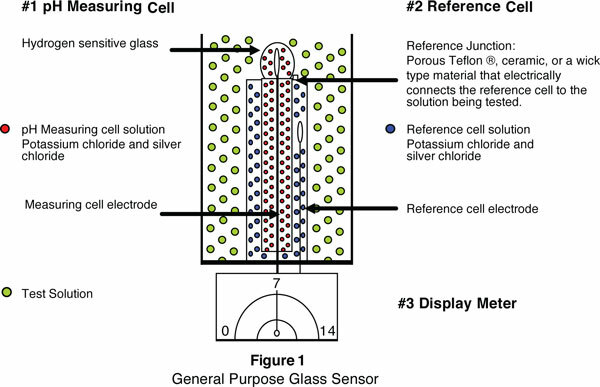 The "Gel Layer" enables hydrogen ions to develop an electrical potential across the pH glass sensor; a millivolt signal varies with hydrogen ion activity on the glass membrane while submerged in the solution being tested. The Reference cell: A silver wire treated with silver chloride (Ag/AgCl) is sealed inside an inert glass housing (cell) with a solution of potassium chloride saturated with silver chloride. The inert glass prevents hydrogen ion activity from test solutions to influence the reference cells constant millivolt signal. The combination of the reference electrode silver- silver chloride wire, and the saturated potassium chloride solution develops a constant 199-millivolt reference signal. The millivolt signal produced inside the reference electrode does not vary as long as the chloride concentration remains constant. The reference voltage is used as a baseline to compare variations or changes in the solution being tested. The reference cell is in contact with the test solution through a reference junction that is commonly made of porous Teflon®*‚ ceramic, or a wick type material called a Pelon strip. This junction completes the measuring circuit of the pH sensor. Display meter: When the pH sensor is placed in a solution, the pH-measuring cell develops a millivolt signal that reflects the hydrogen ion activity of the test solution. A high impedance meter accurately measures the small millivolt changes and displays the results in pH units on either an analog meter or digital display. The pH glass membrane is sensitive to the temperatures of solutions being tested. Prolonged use and/or exposure to temperatures (above 35°C) will accelerate the aging, and increase chemical attack to the glass membrane which will shorten the overall service life of the sensor. ELEVATED TEMPERATURES WILL SHORTEN THE SERVICE LIFE OF A pH SENSOR. Increase temperatures also decreases the impedance of the glass membrane. The decrease of the impedance affects the millivolt output of glass membrane. Temperature changes close to neutral (pH 7) usually do not affect pH levels; however, when levels are < pH 3 and > pH 11 a dramatic error may occur. This problem is resolved using a built in ATC (Automatic Temperature compensation) which uses a mathematical formula (Nernst equation) to correct pH errors due to temperature factors. Because standard glass electrodes are manufactured using a silver/silver chloride electrode inserted into a potassium chloride/silver chloride solution, the following list of solutions cause the reference solution to precipitate. If the following solutions are tested, it is recommended that the pH sensor well be thoroughly rinsed. The testing of these solutions will severely reduce the service life of the pH sensor. Note: This is not a complete list of solutions that can cause the reference solution to precipitate. As solutions approach, and exceed the pH level of 12.0 the high concentration of sodium ions interfere with the standard glass membrane and cause pH levels to be displayed lower than actual pH levels. If solutions being tested are normally high alkaline, (>12 pH) a probe manufactured with special glass may be required. The special glass may be used throughout the pH range of 0 to 14, but due to the high resistance nature of the glass it will significantly increase the overall time to analyze a sample. Constant use in solutions with pH levels higher than 12 will reduce the life of the probe. The break down of the pH sensor electrodes and the depletion, and/or saturation of the reference solution require your pH instrument to be re-calibrated. This should normally be performed twice a month, but depending on the actual use of the instrument it may be necessary to increase the intervals between calibrations. Refer to your Myron L® Company instruction manual for detailed instructions on your specific instrument calibration procedures. The calibration should be performed using at least two pH buffer standards. The initial calibration should use Myron L® pH buffer solution 7. This will check and allow the instrument to be adjusted so its output reflects 0 millivolts, neutral, or pH 7. A second calibration using a standard solution that reflects the normal range of solutions being analyzed. If acidic solutions are normally tested, a Myron L® pH buffer solution 4 should be used. If solutions to be tested are normally alkaline, a Myron L® pH buffer solution 10 should be used. It is not necessary to calibrate your instrument over three standards (4, 7, and 10) unless during normal daily use of the instrument, the solutions being tested varies from low to high pH ranges. In this case an increase of calibration intervals is also recommended. The Myron L® Company uses a general-purpose glass pH sensor. This glass sensor may be used in most applications. To ensure maximum life of your Myron L® pH test instruments, the following information should be considered whether you are a distributor or an end user. It is the experience of the repair technicians of the Myron L® Company that 90% of all premature pH sensor failures can be prevented with the incorporation of a few maintenance procedures. The following procedures should be performed after using the Myron L® test instrument, or if you plan to store your test instrument for an extended period of time. The pH sensor well (fig 1) must be filled with Myron L® storage solution (preferred) or Myron L® pH buffer 4, or tap water with table salt added and its protective cap (with foam insert) firmly installed. Allow the glass membrane to dry out. A de- hydrated glass membrane will not produce the necessary “Gel layer” on the sensor surface, which is essential to allow the exchange of hydrogen ions (measure pH). Allow the reference junction to dry out. The reference junction material is usually a wick or fiber type material that completes the electrical circuit between the reference electrode cell and the solution being tested. Dehydration causes the reference solution to leach out of the electrode cavity, and form crystals in the junction. This is normally referred to as the "Bridging effect". Repeated dehydration of the pH or pH/ORP sensor will cause the instrument to have a slower response time, and be more difficult to calibrate. Dehydration will significantly reduce the normal service life of the sensor. Store spare pH or pH/ORP sensors in a refrigerator. "Do not Freeze". Take proper precautions not to allow the temperature to fall below freezing. This will cause the solution to expand and may damage the electrodes inside the sensor. Storage in a refrigerated environment will slow the evaporation of the storage solution, but not prevent evaporation. Always inspect and replace storage solution in spare sensor well on a regular basis. Note: When using the Myron L® storage solution, it is common for white crystal formations to form around the seal of the pH sensor well and protective cap; this is a normal occurrence as the solution evaporates. Never store the sensor in high purity water (distilled or de-ionized). During the normal use of your Myron L® handheld pH or pH/ORP instruments, the cleaning of your pH sensor bulb will have to be performed. The cleaning is usually due to the deposits of organic or inorganic contaminates left on the sensor from the solutions being tested. If you suspect your instrument is inaccurate, or the display value drifts, or the response is slow and sluggish, perform the following tests. Rinse the sensor well (three times) and fill with Myron L® pH buffer 4 solution. If the pH continues to drift below the pH 4 level (i.e. 3, 2, or 1) repeat the test using Myron L® buffer 10. If the pH level drifts beyond the pH level of 10 (i.e. 11, 12 etc.) the cleaning procedure outlined below may be performed to increase the performance and accuracy of your test instrument. While performing the above tests, if the pH levels of the buffer solutions 4 and 10 actually drift towards pH 7, this is an indication that the pH sensor is damaged and needs to be replaced. Caution: Wear proper eye protection and gloves during the following cleaning procedures. 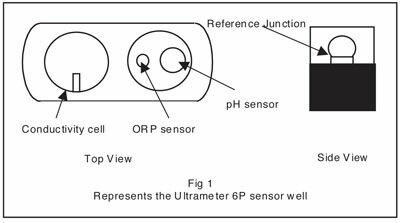 The Myron L® Company recommends the following procedures to clean and recover the pH or pH/ORP sensors. NOTE: Not all pH or pH/ORP sensors can be recovered. Fill the pH/ORP sensor well with 100% Isopropyl alcohol. If not available use additive- free rubbing alcohol (70%). This will remove any oils. Allow the sensor to soak for 10 minutes. Rinse with RO or DI water. Rinse the sensor well (three times) and fill with Myron L® storage or Myron L® pH buffer 4. Replace the protective cap and allow the sensor to recover overnight. Re-calibrate the instrument according to the Myron L® instruction manual that was provided with your instrument. If the instrument fails to calibrate properly, continue to the next step. Fill the pH or pH/ORP sensor well with a hot salt solution 60°C (140°F) potassium chloride (KCI preferred) or hot tap water with table salt (NaCl). Allow the solution to cool. Re-calibrate the instrument according to the Myron L® instruction manual that was provided with your instrument. If the instrument fails to calibrate properly, the pH or pH/ORP sensor must be replaced. The Myron L® Company warrants the pH and pH/ORP sensor assemblies against manufacturer defects. Shelf life for most pH and ORP sensors is 12 months. Failure to maintain proper hydration of the glass pH sensors or the use of the instrument in any manner not described in the operation manual supplied with the instrument may shorten the life of the sensor. *CAUTION: If you do not use your Myron L® instrument on a regular basis or if you are a stocking distributor, the storage solution in the pH or pH/ORP sensor well will evaporate over time and must be replenished. To prevent premature pH glass sensor failure, the Myron L® Company suggests the implementation of a preventative maintenance program. Failure to do so could void the factory warranty. The use of liquids containing high levels of solvents, such as acetone, xylene, and chlorinated hydrocarbons, or other harsh chemicals in your Myron L® instrument is not recommended. Doing so may damage the sensor.